Image: CVS, Walmart, Family Dollar. Design: Ashley Britton/SheKnows. As parents, we work hard to protect our children. We do everything in our power to keep them safe, happy and healthy. But thanks to a seemingly endless string of safety concerns and recalls, the latter becomes harder each and every day. And now, it seems like we have another reason to fret. 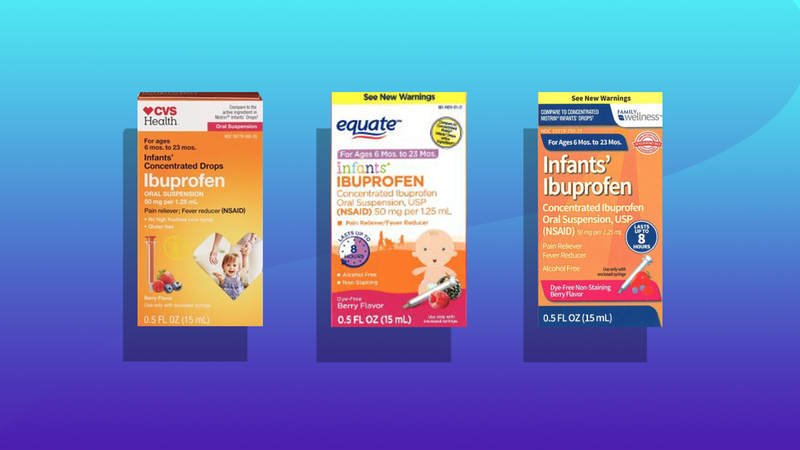 The Food and Drug Administration recently announced the ongoing baby ibuprofen recall has been expanded — and thousands more products have been affected. The recall, which was first announced in early December, impacted infant ibuprofen products sold at Walmart, CVS Pharmacy and Family Dollar. Not all lots or all kinds were pulled from store shelves. According to the initial alert, store-brand labels were affected — and only those bearing very specific NDC (or National Drug Code) numbers. However, on Jan. 29, New Jersey-based pharmaceutical company Tris Pharma added three new lots to the recall: CVS Health lot 4718, CVS Health lot 00717006A and Equate lot 00717005A. It is important to note that the recall remains voluntary. To date, no illnesses or side affects have been reported. However, since the units involved in the recall were found to contain 10 percent more ibuprofen than specified, vulnerable infants could experience nausea, vomiting, stomach pain and/or diarrhea as well as tinnitus, headache and stomach bleeding. They could also face permanent kidney damage. The FDA advises consumers to discard these products immediately and/or return them to their place of purchase. For more information about the recall, contact Tris Pharma Monday through Friday at 732-940-0358. If you have any immediate concerns, contact your child’s doctor or health care provider.